Commercial Turkish trucks wait to cross to Syria near the Cilvegozu border gate, located opposite the Syrian commercial crossing point Bab al-Hawa in Reyhanli, Hatay province, Turkey, Sept. 16, 2016. The Obama administration is warning Russia that their military cooperation in Syria will not go forward unless humanitarian aid begins to reach Aleppo and other besieged areas. In a statement released by the State Department, Secretary of State John Kerry told Russian Foreign Minister Sergei Lavrov that the U.S. has "concerns about the repeated and unacceptable delays of humanitarian aid, and emphasized that the United States expects Russia to use its influence on the Assad regime" to allow the deliveries to move forward. Russian warplanes Friday launched airstrikes on a rebel base in Aleppo. Russian officials said they did so because of rebel refusal to pull back from a key road leading into eastern Aleppo. Under the cease-fire deal both the rebels and Assad regime forces are meant to withdraw from the Castello Road, a key supply route for the rebels, handing security control to the Russians. Rebel leaders say this would be tantamount to just handing their hard fought positions to Assad. A rebel fighter walks by damaged buildings near Castello road in Aleppo, Syria, Sept. 16, 2016. United Nations aid trucks packed with supplies for civilians trapped in the besieged Syrian city of Aleppo were still stuck at the Syrian border Friday, as officials wait for confirmation that Syrian troops and rebels are committed to upholding the shaky cease-fire agreed to last week. A spokesman for the U.N. humanitarian affairs office said 40 trucks are waiting at the border between Turkey and Syria until officials receive word that it is safe to enter the country. Syrian state television broadcast images appearing to show bulldozers clearing the main road into rebel held neighborhoods of Aleppo in preparation for the aid convoys. Jens Laerke said the United Nations does not need authorization from Syria to deliver the supplies across the border, but the trucks are sitting in a “special customs zone” until it is safe. "We know that there’s at least a quarter of a million people in eastern Aleppo who are potentially all of them in need of some kind of aid," Laerke said. "“We are as ready to go as we can possibly be...it’s highly frustrating – we know the world is watching." The United Nations has described the cease-fire as a “critical window of opportunity” to deliver the supplies in the rebel-held eastern districts of Aleppo, but rocket fire and shelling in the area on Friday hindered the trucks' movement. 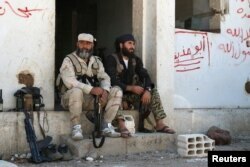 Syrian state media claim clashes between troops and rebels had broken out in Aleppo, in violation of the cease-fire. 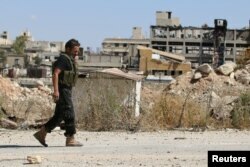 The Syrian Observatory for Human Rights reports the fighting also broke out in the Damascus neighborhood of Jobar, the home of several different rebel factions. Meanwhile, Syria’s armed rebel factions are planning to meet Sunday to discuss whether to continue to observe the now fragile four-day-old cease-fire brokered by the United States and Russia — a truce no one consulted them about and one they fear will be exploited by Syrian President Bashar al-Assad to renew an offensive on insurgent strongholds in the besieged city of Aleppo. The rebel observation of the cease-fire, which took effect Monday evening to coincide with the start of the major Muslim holiday of Eid al-Adha, has so far been a begrudging one and marked by distrust of American intentions toward a revolution that has left more than 400,000 people dead and half of the country’s population displaced. There is, however, no overall unity among rebel factions about how to move ahead, although most rebel leaders contacted by VOA say they sense the cease-fire is a trap and marks a further sign of U.S. reluctance to back the revolution. Its breakdown is inevitable, they say. U.S. officials see the cease-fire — the second negotiated this year by Washington and Moscow over the heads of rebel militias - as a possible trigger for subsequent serious negotiations about a political transition for the war-wracked country. Rebel leaders, however, don’t believe President Assad — or his foreign backers Russia and Iran — have any wish to negotiate a political settlement and argue the weaker the insurgents become, the less likely that is to happen. “The armed groups on the ground are still discussing what they should do about the cease-fire,” Gen. Salim Idris, former chief of the staff of the Western-backed Free Syrian Army, told VOA. Syrians enter Turkey from the Turkish Cilvegozu border gate, located opposite the Syrian commercial crossing point Bab al-Hawa in Reyhanli, Hatay province, Turkey, Sept. 15, 2016. The lack of transparency in the superpower deal-making is adding, he said, to suspicion about the entire deal, making it appear murky, which is adding to rebel distrust of Western intentions toward the revolution. “I am sorry to say there isn't any trust,” he said. On Thursday, U.S. State Department spokesman Mark Toner told reporters in Washington that the full text of the deal worked out with Russia on the truce in Syria will not be made public. “It does deal with sensitive issues that we believe, if made public, could potentially be misused,” he said. Confusion about the deal, which among other things is meant to ground Assad’s warplanes, even appeared to wrong-foot U.S. Secretary of State John Kerry, who said on Monday that the U.S. and Russia could permit President Assad to launch new airstrikes against jihadists fighting alongside more moderate rebel factions. His remarks were quickly walked-back by a spokesman, who said later there were no provisions under the nationwide truce for U.S.-Russian authorization of bombing missions by Assad's forces. A letter sent to rebel factions by Michael Ratney, U.S. Special Envoy for Syria, explaining the cease-fire, has added to confusion and suspicion. He noted in the letter that militias will need to pull their fighters back from some strategic locations, including the Castello Road, a key route that swings around northern Aleppo and into the insurgent-held eastern part of the city. The envoy, however, was vague about locations and what is expected of the armed groups, several of whom have responded by asking for clarification. Even in his letter, Ratney noted his own suspicions of the Russians, saying he did not think they were being honest, according to Gen. Idris. Lt.-Gen. Sergei Rudskoi, center, of the Russian Military General Staff listens to Russian and Syrian officers during a video call, as a Syrian army facility is displayed on screen, at a Russian Defense Ministry building in Moscow, Russia, Sept. 12, 2016. Other rebels note Russia plans to move to the Mediterranean next month the aircraft carrier, the Admiral Kuznetsov, for its first combat deployment. The warplanes abroad will be equipped with some of Russia’s latest targeting systems and air-to-surface missiles, adding to the firepower the Assad regime would have available for a renewed Aleppo offensive. As the rebels continue their discussions about whether to continue to observe the shaky cease-fire, some commanders say U.S. leverage on the factions is weaker than earlier this year because of the increasing reluctance of the U.S. to resupply rebel factions with arms and ammunition. In recent months, Zakaria Malahefji, an official with Fastaqim Kama Umirt, an Aleppo-based Free Syrian Army militia, said most U.S. and Western support has “mainly been just of logistical equipment” and not desperately-needed arms and ammunition. Some arms supplies have come from the Turks, he said, but he was reluctant to go into details. So far, the cease-fire has seen a significant reduction in violence. But the pro-opposition monitoring group — the Syrian Observatory for Human Rights, which relies on a network of activists on the ground for its reporting — said Thursday witnessed a “dramatic escalation in violations” committed by both regime and rebel forces. It reported regime warplanes renewed airstrikes in the northwestern countryside of Aleppo and in the northern countryside of Hama, wounding rebel fighters as well as civilians. Russian military officials accused rebel armed groups of a total of 55 cease-fire violations on Thursday, 23 of which they said occurred in Aleppo. Rebel fighters rest with their weapons in Quneitra countryside, Syria Sept. 10, 2016. As rebels debate whether to continue to observe the cease-fire deal, a Russian official Friday told Britain’s BBC that Moscow could resume airstrikes on rebel groups in Syria unless the U.S. does more to get them to disassociate themselves from former al-Qaida affiliate Jabhat Fateh al-Sham, previously known as Jabhat al-Nusra. The cease-fire deal does not cover JFS, a key group in the defense of rebel-held districts of Aleppo and of insurgent strongholds in the neighboring province of Idlib. Russian Deputy Foreign Minister Mikhail Bogdanov told the BBC there were limits to Russian patience. “We're waiting, but there are limits," he added. Tthree civilians were killed Friday when regime warplanes carried out airstrikes on rebel-held areas in Idlib province. 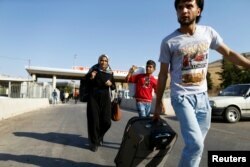 They are the first since the cease-fire started Monday in an area covered by the truce. Meanwhile, American officials confirmed that U.S. forces have begun working with Turkish forces in northern Syria to take on Islamic State (IS). A U.S. official told VOA the group of U.S. Special Forces is now accompanying some Turkish forces in the area of al-Rai, with the hopes of helping push south and east toward the IS-held town of Dabiq. Dabiq is considered significant in part because it plays a key role in the terror group's apocalyptic beliefs. But already, the U.S.-Turkish efforts may have hit a snag. Video posted Friday to social media appears to shows a handful of U.S. commandos forced to pull out of al-Rai and back toward the Turkish border. In the video, rebel forces in al-Rai appear to be shouting and chanting anti-U.S. slogans.